John C. Mannone discovered poetry in Charlotte, NC in May 2004. His poetry blends lyrical tones rich in imagery. As a physicist, his passion to understand the universe is only surpassed by one to know its creator. He has formed PoeticWord Ministries to share this passion. He is a professor of physics at Hiwassee College (Madisonville, TN) and consults in the nuclear industry. He holds advanced degrees in Electrical Engineering (Ph.D. candidate), Plasma Physics (M.S. ), and Physical Chemistry (M.S.) and is actively engaged in amateur radio astronomy research. He is frequently sought as a speaker in astronomy outreach events. John is an instrument rated pilot and resides in north McMinn County, Tennessee with his beautiful wife Lyda. His poetry appears in Iodine Poetry Journal, Thrift Poetic Arts Journal, Astropoetica, Poetic Praise (2005 Anthology of Rhyme N Chatt), Frontage Road, The Reflector, Swiss American Historical Society Review Journal, The Society of Amateur Radio Astronomy Journal, the International Dark-Sky Association Newsletter, and the Cleveland Banner. His work has been accepted to appear in the prestigious Astronomy Calendar, by Guy Ottewell (Universal Studios) in 2007. Mannone has won poetry awards in area contests. Two poetry collections are in progress, Shards of Space: A Poetic Tour of the Universe and another yet unnamed spiritual and Biblical narrative poetry. John has an “office” in Trutopia, which features The Craft of Poetry (though this is a predominantly screenwriters site, the cross-pollination of literary arts potentially has an influential effect). Though the literary aspects are limited here, his astronomy website is different than most: Adventures in Astronomy. conspicuous as the creviced seascape. I could tell it was them. casting ominous shadows in the sand. darker than a storm cloud thick with fury. trapped in a blind alley. What would be fitting for Darwin to say? What about Lorentz? It’s imperative! We demand it! But ears are blind to answers. Blind is a poem stimulated by an encounter with barracuda on Sombrero Reef in the Florida Keys in 1978. But before describing it, I first want to give a little background. A few miles off Marathon Key on the Atlantic-side, Sombrero Reef displays many deep fissures, canyons, and gorges, but the water depths are shallow to moderate (35 feet). Barracuda abound here, but their behavior is predictable and not with malicious intent toward divers. However, the Great Barracuda does have an exceedingly evil look. It is a large sleek and silvery fish (5-7 ft.), which seems to be mostly teeth. It is extremely curious and territorial. It has caught many by surprise, coming within inches of shiny gear, fins, or bubbles. However, more often it will suddenly appear in front of you, 5 to 10 feet or so, in a lateral position. If it thinks you are encroaching too close to his territory, it will start side-wise undulations, “inching” closer to you, change to a dark mottling reminiscent of army fatigues with a metallic cast, and gnash its teeth bristling needle-like razors. It makes a formidable statement of authority. All one can do is to gently, but quickly back-peddle their fins like a ship coming to full stop and reversing screws to increase separation and proceed giving extremely wide berth. Though there may be many barracuda in the area, my encounters have all been one-on-one. Most notably with the “grandfather,” which is the dominant territorial male. It is the largest in a given patch of reef and will be the one to most aggressively defend it if challenged. This is a no-brainer. I always yield in submission and retreat. 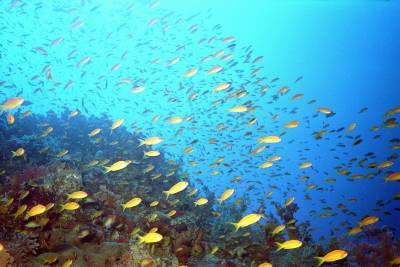 In June 1978, I was diving this reef, accustomed to the plethora of ‘cuda. My air was low and I made way back to the boat, perhaps 100 yards away. The visibility was very good, 50-70 feet, and the fish teamed among the corals. I saw this school of yellow tail snapper, must have been about 500 hundred, maybe much more. They were huddled together next to the coral swaying with the sea surge— beautifully choreographed. Except for the large size of the school, it was not an unusual sight. But this time, a shadow seemed to grow out of nowhere. It soon became apparent it was from a wolf pack of barracuda. I had never seen this behavior before nor read about it. But I did know that behavior in a pack takes on a collective consciousness; it is often very different from individual behavior. It’s as if instant bravery and aggression is born from a massive group. I have seen this show-off behavior in dogs and lemon sharks. It is something to fear. The pack of a few hundred barracuda, formed a wall of offense, pinning the yellow tails in a “blind canyon.” Individual barracuda would attack the school and resume their position; if not, the gap was filled by another barracuda. They were methodical, ruthless, ravaging. Unfortunately, I had run out of film and could not record this prize-winning encounter. I did not dilly-dally, but made it straightway back to the safety of the boat. My diving experiences (over 80 hours bottom time between 1975-1992) are memorable and act a fertile seabed for poetic writing, providing a fresh source of metaphorical expression. When I wrote poem Blind, I wanted to be the voice of one of those yellow snappers. Though the poem describes a true event, it is not merely a poetic narrative, but also a metaphor for human behavior; i.e., the drama of our world blindly being played-out, often in blind canyons.